KUOK FOUNDATION BERHAD invites applications for the above awards from Malaysian Citizens applying for or currently pursuing full time undergraduate studies at selected Malaysian Private Universities / Colleges. (3) Priority given to science stream courses. Completed forms must mach the Foundation on or before 15 July 2015. Only shortlisted candidates will be notified for interview. 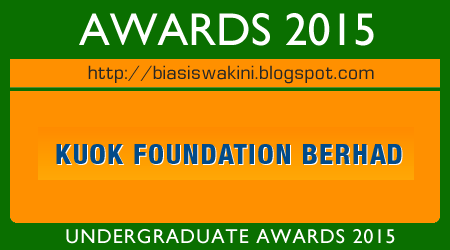 0 Komentar untuk "KUOK Foundation Undergraduate Awards 2015 - Private Univ / Colleges"